A prominent sign to the sight of any Baysider commuting along the Nepean Highway recently between South Road and Cummings Road. Plans for a Trans Pacific Partnership (TPP) by the Abbott government may seem at first something of a far off concern for Baysiders in their day-to-day lives in our seaside suburbs. Yet, any Baysider commuting along the Nepean Highway recently would have seen the following sign over North Avenue between South Road and Cummings Road. 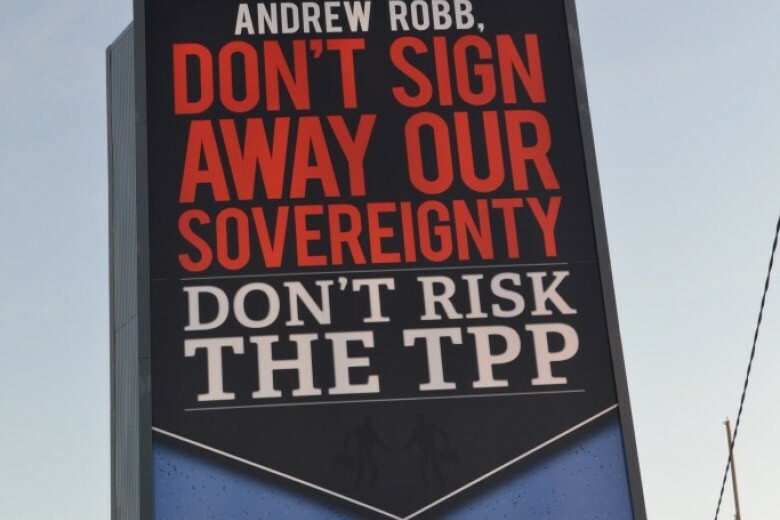 The poster by civic activist group Get Up implores Andrew Robb, local MP and Member for Goldstein, to alter his policy direction on the planned TPP that would involve 14 nations including the United States and New Zealand alongside Australia. Mr Robb, the Minister for Trade in the Abbott government has been a key player in Australia’s negotiations on the proposed TPP. Though the proposed trade agreement between the United States and a number of participating Asian and Latin American nations has not yet been enacted – nor finalised therefore – by participating nations, it has garnered an inordinate amount of controversy and criticism from close-to-home and further afield. This has been especially so as it relates to the secrecy surrounding the negotiations of participating nations so far. While such secrecy may be standard practice within the private sector, civic groups such as Get Up have voiced their concern that Australians would only stand to learn the contents of the TPP once it has been signed and brought into effect by the Abbott government. For his part, Robb has labeled the criticism of the TPP so far as a scare campaign. Yet, by contrast the very assertion that ‘people have nothing to be afraid of’ isn’t able to prove or disprove by any fair measure when negotiations of the TPP remain under wraps. So, what does this all mean for Baysiders and the local community? Due to the aforementioned secrecy above it is as yet unclear the exact nature of what a signed off TPP deal may contain. Yet, what is clear so far is certain areas such as agriculture, health and intellectual property have all been cited as core areas for the negotiating table. From a distance these may seem like broad areas but in the day-to-day the an altering of the agricultural policy could see local fruiterers able to lower their prices on imported goods. By contrast, a reform of the health industry could be see the cost of pharmaceuticals rise. Yet, one idea understood to be in the negotiation so far has been better received. The TPP’s desire to seek a basic universal standard and recognition of copyright and other intellectual property across participating TPP nations would offer an international avenue for protection of artist rights’ and property. While such an agreement could perhaps only be seen as the first step of an effort to crack down on piracy, it would provide a great security and level of protection to local artists, photographers and designers in Bayside than has been otherwise offered prior. The TPP’s efforts in this area would also be seek to offer a bulwark against breach of copyright and intellectual property theft. With the rise of China – that while is commended for its economic growth has been criticised for its large-scale failure to observe copyright and crack down on piracy – alongside the existence of the TPP in a world of borderless eCommerce and online business exchange; this area of the policy has garnered a significant gravitas. In turn, while these trade negotiations may be taking place in Canberra, Washington and elsewhere further afield, the TPP’s establishment appears likely to have a significant bearing on Baysiders in their daily lives and business. So, where to from here? All up the exact nature of the debate and eventual resolution to the TPP remains a ‘wait and see’. Yet, just as this international issue was visibly raised via a billboard over the Nepean Highway recent weeks, so too does the implication of any TPP agreement – for better or worse – promise to have a substantive impact on our local community. It remains an issue to watch then in coming weeks and months, both for our local community and further afield.